Britain's leading female jockey Hayley Turner has been given a 10-day ban for failing to ride out a finish at Lingfield on Friday. Turner, 32, appeared to stop riding close to the winning post on the 6-4 favourite Singular Quest, who finished fourth in a maiden stakes at 14:00 GMT. Stewards found her guilty of "failing to ride out on a horse that would have finished third". The 9-2 chance Sparring won a tight finish covering the first four. 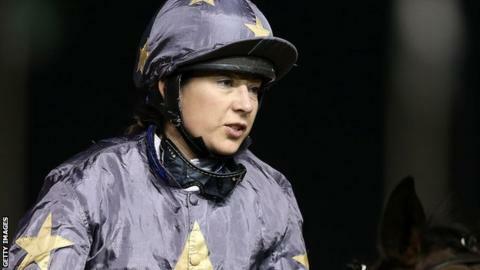 Turner, whose career highlights have included being the first female British jockey to ride 100 winners in a year, will miss 10 days of racing between 13 and 24 February. Turner told the Racing Post: "I deserved it. I've never done it before in all my years riding, but it was human error and I hold my hands up. "I didn't ease up though. I mistook the winning line. When I stopped riding I thought it was the winning line. I can't argue with the punishment."